It was day three today, and today was all about my attitude. I woke up this morning, and did some wake-up yoga poses (very simple stretches, really). I thought I was going to have a headache, but I believe the stretches helped scare it away. I made my Salada Citrus tea with antioxidants, and fixed up my day one breakfast consisting of a grapefruit and banana. I love banana’s when they are slightly overripe. All of the natural sugars come to the surface, and it just tastes a whole lot better than a not-so-ripe-banana. I drank some water with lemon wedges, and put on my running gear. It has been awhile since I have gone on a run, so I made sure to stretch. I have many friends who dismiss stretching, and say “Oh, I don’t need to stretch.” Stop the madness! There are many people who say stretching doesn’t matter, but after many years of running, I have concluded that I personally, must stretch before and after a run. The benefits of stretching are the warming up of the muscles, decrease in injury, and it helps increase flexibilty. Plus I think it just feels good. Today I felt a lot of pain in my hamstrings, for no particular reason, and I found stretching made me feel much better. I even found less pain after I had run. I typically go for a mile, or two miles if I am feeling adventurous. In high school I was more of a sprinter than I was long distance, but I can maintain a steady pace and go for a mile without losing a lung. After my run, I stretched and cooled down. When I washed up, I used Neutrogena’s Naturals Purifying Pore Scrub. I highly recommend this, especially when on a detox. This pore scrub has no harsh chemicals, and instead contains willowbark and jojoba beads. These strange items are good for the skin, and do not burn it like some other facial products will do. It is a really great scrub, and I always feel very clean after using it. On a detox, some studies recommend using natural facial and body cleansers. If you are using cleansers with high amounts of chemicals, you aren’t maximizing the decrease in toxins. As for food, I had leftover brown rice with vegetables, and two kiwis for lunch. My mother informed me that the kiwi is another super food, it contains many vitamins, minerals, and it is so delicious! Kiwi’s are very easy to eat, just cut in half and scoop out with a spoon! I also had a before work snack of a mango, strawberry, banana, orange and spinach leave smoothie! 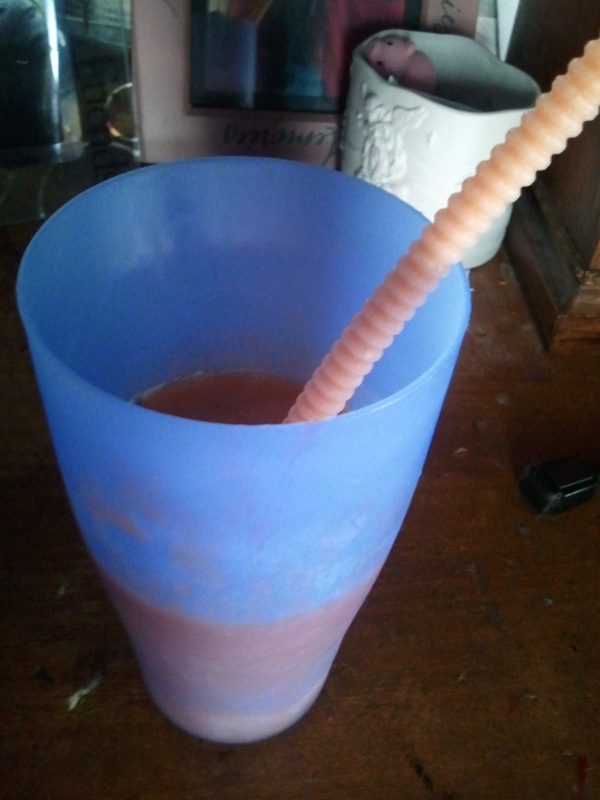 Complete with a bendy straw. The straw definitely made it taste better! At work, I snacked on carrot sticks, and had a baked sweet potato for part one of my dinner. When I came home, I whipped up some stir-fry, this time I added small chunks of celery. All of the other vegetables go nicely with this refreshing vegetable. I also added yellow peppers, because it’s important to have your bright colors each day. At last the day winds down, and I sip on my Salada tea to relax. Today was all about attitude. I woke up with a positive attitude to get things done. I did yoga, and went for a run. I could have slept in until the cows came home, but instead I put a smile on my face and made the best of a beautiful day! Side note, I also did some belated spring cleaning! It all depends on your attitude. If you can think positively, you can do anything! You are always right! Having a positive attitude can make you have a better day! Like they say, shoot the moon, if you miss at least you’ll land among the stars! Quite the inspiring post there Madi. I’m glad u had such a nice day! Good to see that the detox isn’t having adverse effects on you! Thanks Colin! This detox is definitely making me feel a lot better, physically and mentally. If only my boyfriend was back in town, then I’d have an even better attitude….